Don’t tell me I’m the only one who loves crullers. These little longish, brittle like crunchy and hollowed things can be the final pieces needed to make your savory noodle or porridge a hundred percent perfect. The story of fried crullers originates from China, when a devil couple made a bundle of evil actions to the Cantonese people. As a result, people caught and fried them in a giant hot oil wok. That’s why you see two parallel strips adjacent to each other in one cruller. It’s scary to hear this story, but the reason why ancient people ate crullers is so lovely. They ate crullers to reminisce of the evil things that their ancestors had in the past, thus avoiding to do brutal actions in practice. I tried many cruller recipes but in the end of each time, I failed. My crullers are not hollowed inside no matter how I tried to adjust the heat. You know that it’s so annoying for me if I can’t dip a crunchy cruller into my Pho (Vietnamese Beef noodle) . I should be terse here or it’s gonna be a page of describing how perfect Pho combines with crullers. The problem in making crullers is that you have to know well about your ammonia – an old leaven in baking. Ammonia is very easy to evaporate, even though you try to tight it up in an air-tight container. Thus, don’t be greedy when you buy ammonia. A 1 or 2 oz ammonia container is enough for several months without harming the quality of ammonia. I also figure out that do let the cruller dough rise for 12 hours instead of only 4 – 5 hours as some online recipes suggest. As long as the fermenting process is under 19 hours, your dough is still okie dokie. I almost forgot to tell you that you should be careful when open the cap of ammonia container. The smell of it would be compared to that of a baby’s diaper after she drinks a big bottle of milk. Special equipment: A wok or a deep pan. Crullers will need a lot of oil to be puffed. – Stir water with ammonia, alum, baking powder and salt to dissolve. – Add in the flour and use a fork to stir until the flour is roughly incorporated. 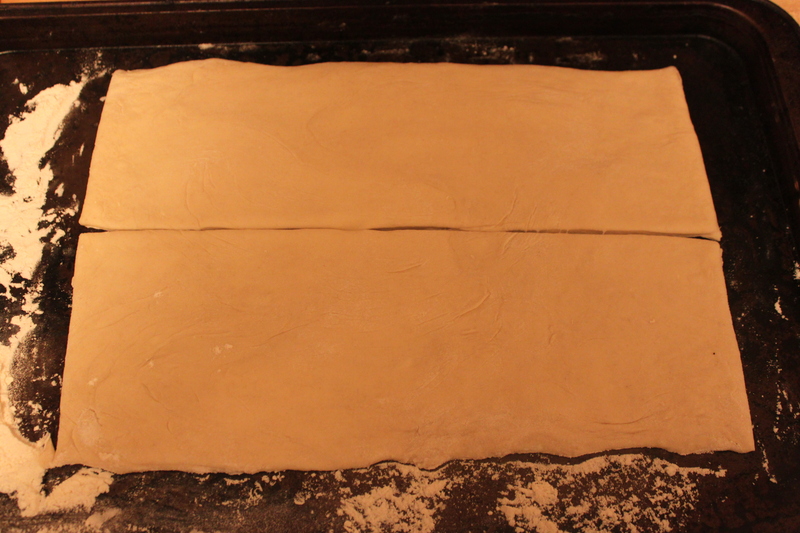 – Knead the dough for 5 minutes until you see a roughly smooth face of the dough. – Slightly oil the dough and cover the dough with a plastic film. – Keep the dough in a clean place and forget it for 12 hours. – Add too much oil into a wok (it’s best) or a deep pan at medium heat. 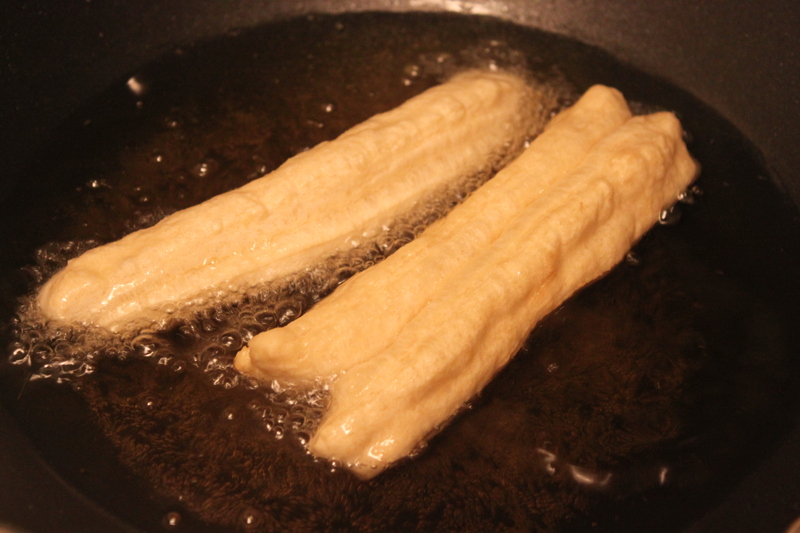 The cooking oil will need 10 – 15 minutes to reach the right temperature for frying. 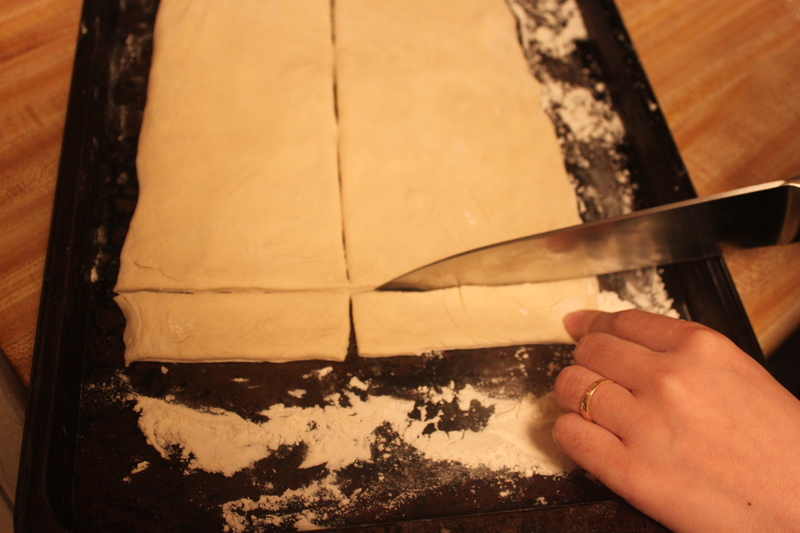 – Roll the dough into a thin rectangular. Cut the rectangle into two smaller rectangles lengthwise. Then cut it into 3/4 inch strips crosswise. – Atop one strip onto a strip. 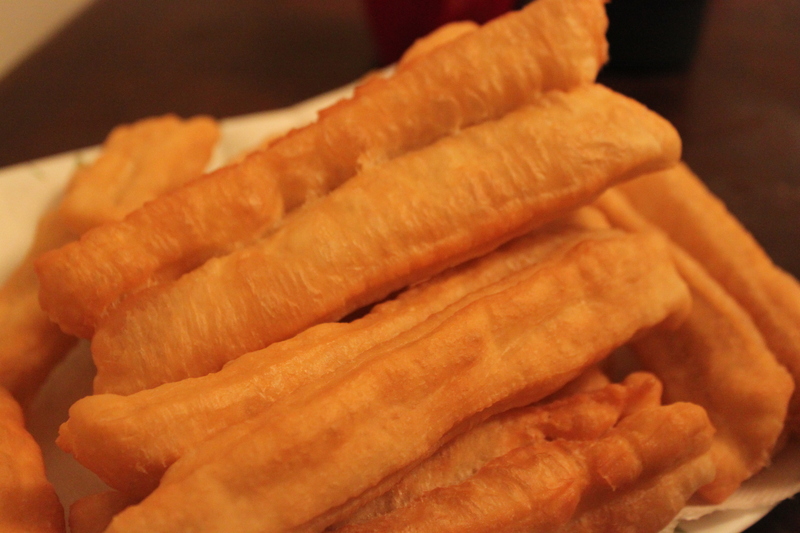 Use a skewer or a chopstick, dip it into the water and press the dough to make sure two strips are stick to each other. 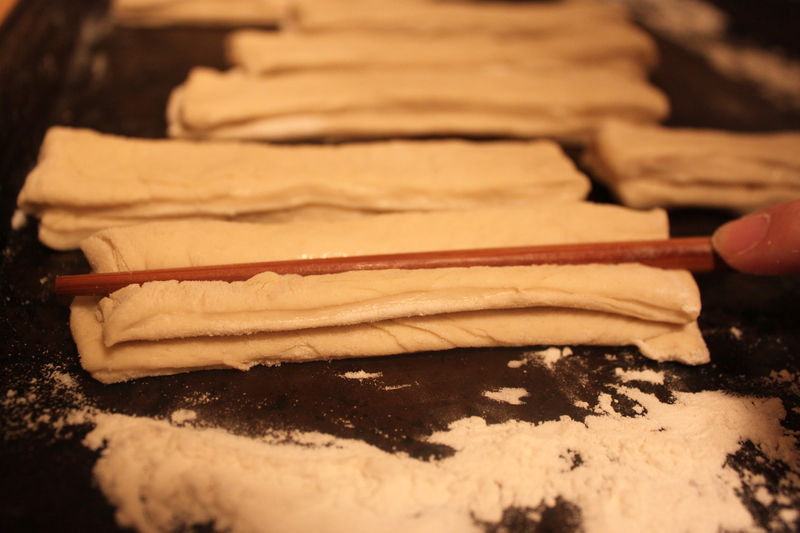 – Gently pull the strips to elongate them to 20 cm in length ( just eyeball it) and throw it into the oil. – Turn the crullers frequently to make them puffed totally. Fry the crullers until they’re golden brown. Serve : you can dip the crullers in any noodle, especially Pho. Or you can even cut it to your porridge. Or you can enjoy themselves. This entry was posted in bread, Chinese, Vietnamese and tagged chinese crullers, chinese fried bread, quẩy, vietnamese crullers, you tiao. Bookmark the permalink.